Peugeot will launch its eagerly anticipated new 2008 compact crossover this summer. 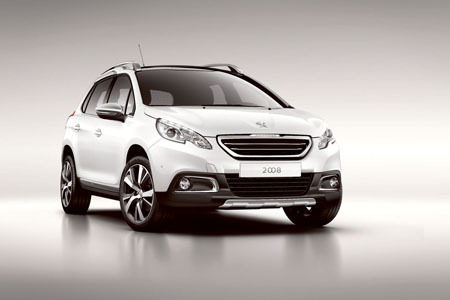 Modern and stylish, the new Peugeot 2008 is firmly based on the new 208, Continental Irish Small Car of the Year 2013. With a perfect mix of contemporary styling, clean, and efficient engines and a versatile, high-quality cabin, the new Peugeot 2008 is a clear illustration of the brand moving up-market. It is destined to attract new customers to the Peugeot brand all around the world. Peugeot has had proven success in the compact car segment, with sales of more than 15 million ‘2’ series vehicles over the years. The marque is also noted for its success in the Crossover segment; Peugeot 3008 was crowned Irish Car of the Year 2010. Blending the success and design of the award-winning 3008 with all the features, performance and state-of-the-art engines of the new 208, Peugeot has merged two fields of excellence into one new vehicle to develop the 2008. At just 4.16 metres long, the 2008 combines the driving characteristics of a hatchback with the strengths of an SUV to allow space, modularity, and comfort. Equally at ease in town as on the open road, the 2008 will suit a diverse spectrum of customers. The 2008’s floating grille is cut from a solid block and sculpted headlamps with LED daytime running lights blend seamlessly into the nose. Stylish matt-finished alloy wheels, black bumpers and body sills, stainless steel front and rear scuff-plates, and chromed side mouldings all add to the attraction. From the side, the car presents a strong yet elegant profile, enhanced by roof bars which hint at the car’s practicality and versatility. At the rear, the wide tailgate and low loading lip, just 60cm off the ground, mean exceptional ease of use. The interior of the Peugeot 2008 provides passengers with a spacious and flexible cabin, a cockpit-style instrument panel, and an aircraft-type handbrake. A satin chrome finish to the air vents, handbrake lever, steering wheel, gear lever, and touch-screen trims adds to the level of luxury and creates a premium feel. The 2.54m wheelbase means generous space for every occupant of the 2008, while the ergonomically designed seat backs mean it’s particularly roomy for rear passengers, who also benefit from a 12v power socket for the connection of a portable device. The boot is exceptionally spacious considering the car’s compact dimensions. The floor comes with five recessed rails which run from the sill to the front seat backs. Six chromed hooks allow items to be secured safely. There is a storage area on each side, with a retaining strap and net. Folding the 60:40 split rear seats boosts storage volume from 360 to 1,194 litres, (22 litres under the floor ). One press of the button at the top of the rear seat back is all it takes to fold the seat, as the base cushion retracts automatically. Safety on the 2008 is at the highest level. Cruise control with speed limiter is standard on all versions, as are six airbags, ESP with anti-skid regulation (ASR ), stability control, emergency braking assistance (EBA ) and electronic brake force distribution (EBFD ). Isofix mountings for child seats are found in the rear. Park assist is also available on the 2008. Ultrasound measures an empty space and steering is then controlled by the vehicle to position the vehicle perfectly. Peugeot says that the latest-generation engines matched to the use of light materials and a profiled silhouette has ensured a real breakthrough in the segment in terms of fuel economy and CO2 emissions. The engine line-up for Ireland is as follows: the 1.2 VTi 82 bhp petrol engine (114 g/km CO2: tax band A4 €200 road tax ); the 1.4 HDi 68 bhp diesel engine (104 g/km CO2: tax band A3 €190 road tax ); the 1.6 HDi Ecomatique 92 bhp diesel engine (98g/km CO2: tax band A2 €180 road tax ); the 1.6 HDi 92 bhp diesel engine (103g/km CO2: tax band A3 €190 road tax ), and the 1.6 eHDi 115bhp diesel engine (105g/km CO2: tax band A3 €190 road tax ). The latter three feature stop start. Peugeot also say that shortly after launch, the 2008’s engine range will be extended further in Ireland with a 1.2-litre e-THP Stop Start 82 bhp petrol engine (99g/km ). The new 2008 will make its debut in Ireland this summer. Prices and equipment levels for the Irish market will be announced closer to launch. Page generated in 0.1205 seconds.